Through the Muck Foundation, the Muckenthaler Motor Car committee has dedicated over 20 years of enriching and improving lives of children through arts and education programs. It’s a strong relationship between the Center and the committee that keep this show going. Making its debut in 1994, the Muckenthaler Motor Car Festival features beautiful and rare vehicles displayed on 8 acres of the Muckenthaler Mansion. Please join us at this event where owner Matthew Means was selected to show his ALL ORIGINAL 1960 Lincoln Continental Mark V! We would love to meet everyone and talk about future, current, or past projects! There will be 2 different shows. HOT RODS is on Saturday, while CONCOURS D’ELEGANCE will be on Sunday. This show is near and dear to our heart as it is hosted by a friend of our, previous client and Marine Corp veteren, Mike Green. We would also like to announce that Anaheim Rod and Custom will be guest judges at this event. This event is open to all show cars, trucks and special interest vehicles. We have a stack of registration forms here at the shop! The Classic Auto Show is a place where the entire classic car community can come together and celebrate everything on wheels. Whether you are working on a project, a collector, or simply share a passion for the car community then this is the event for you. This event will exhibit over 2,000 vehicles both indoor and outdoor at the OC Fair and Event Center, which will also include rare, museum quality vehicles. There will also be special exhibit areas which will include: Hot Rods, Lowriders, Japanese Classics, Vintage Off Roaders, Women Builds, Motorcycles and more. Take advantage of discounted group rates, and reserve your room at one of the official Classic Auto Show hotels. Here’s a car show that is near and dear to our heart due to our love for the high dessert! After attending this show last year, it proved it was one to be seen by many more. Many different varieties of cars and vendors were present which means there is something for everyone’s taste. With this event being held at The Indian Wells Tennis Garden in the beautiful Coachella Valley/Palm Springs area in the sun, it is recommend to pack and dress accordingly. Would not want to risk getting to hot and having to go home or being to cold and not enjoying the beautiful vehicles. Event will be held RAIN OR SHINE. Please no pets (service animals accepted), no alcohol, no golf carts, and no burn outs. There will be many food options and vendor available. There will also be a raffles and a silent auction. IT’S BACK AND IT’S BIGGER! Thanks to everyone that showed support in 2018. They are now working towards making 2019 bigger and better! The show is entering its 70th year! Being once known as the Oakland Roadster Show, it now continues to be the longest running indoor car show! With over 500 show vehicles inside the buildings, another 400-500 will join in on Saturday & Sunday for the 14th Annual Grand Daddy Drive-In! There will also be vendors in the halls selling vintage clothing, items, and much more! When calling to book rooms at the Marriott, remember to mention Rhythm Collision for special rates! CALL NOW ROOMS SELL OUT FAST! WHEN THEY SAID 2017 WAS THE LAST MOONEYES X-MAS PARTY, THEY MEANT IT! Speedway management pulled a miracle and said they could hold the x-mas party AGAIN at the Irwindale Speedway! A show filled with Hot Rods, Customs, Choppers, Pin-Up Contests, Vendors, Live Music and everyone’s favorite, the DRAG RACE! The ARC team is excited for the return of this all around favorite. Be sure to catch us there along with Becky’s right hand gal, Makayla, with her mother, Shannon, and their two vehicles, a ‘55 Chevy Bel-Air and ‘63.5 Ford Falcon Sprint. We plan on registering one or two of our vehicles as well. Join In-N-Out Burger and Hot Rod Magazine to celebrate 70 years of burgers and burnouts! Walk through the history of HOT ROD! Come by to see new cars and some that were featured in Hot Rod through the years and stick around to watch nostalgia drag races on the Pomona dragstrip! It is sure to be an experience to tantalize ALL of your senses as you see the beautiful classics, hear live music, feel the vibrations of the engines and smell and taste some In-N-Out burgers grilled fresh onsite with In-N-Out Burger’s cookout trucks! Who could ask for anything more? Register as a car show participant and join the Show-N-Shine with HOT ROD Editor’s Choice Awards and In-N-Out Picks. All makes and models welcome! Spectator Tickets: Advance tickets are $15, on-site tickets are $20. 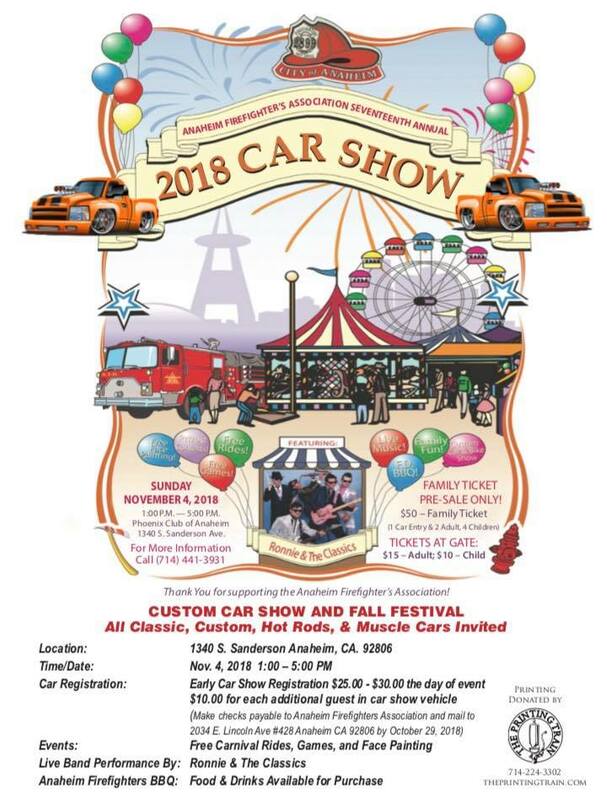 Anaheim Firefighter’s Seventeenth Annual 2018 Car Show and Fall Festival Welcomes All Classic, Custom, Hot Rods, & Muscle Cars. It is always tons of fun for the whole family! There are cars and firefighters to drool over plus carnival rides and games for the kiddies! It's time for another vehicle delivery party at Anaheim Rod and Custom! Join us THIS Saturday November 3rd to celebrate the completion of a beautiful 1965 Buick Riviera. The owner, his friends, family, current, past, and potential clients will be in attendance. Light bites and libations will be provided. EVERYONE HAS FUN AT SILVERADO DAYS! Come check out the best entertainment money can buy! Having so much to see and do, you will wish that it lasted longer than 3 days. You can enter in many contests, while also having plenty of cars and other entertainment to enjoy! There will also be a VARIETY of different foods, some you did not even know existed. The Dead Sleds C.C.& The Huff Family have the pleasure in bringing you another fun filled family event, honoring the late Custom car painter and fabricator Bo Huff. Kustoms, Lowriders, Classics, Viclas, Everyone is welcome! Pinup contest, Beer, Live bands, Delicious Food, Lots of vendors!!! Registration for this show has been closed. Chimera Motors would like to welcome previous customers or those who just want to visit a cool place with some cool cars down to their warehouse August 18th from 9AM to 1PM. Come on down to Chimera Motors in Huntington Beach for some free stuff! Not only will they have free swag for grabs but they will also have FREE BBQ and drinks! Along the list of free stuff there will be FREE classic car valuations by Hagerty and FREE raffle prizes. 2017 SEMA Show Dates. SEMA Show takes place Tuesday, October 31 - Friday, November 3, 2017 at the Las Vegas Convention Center. The SEMA Show is the premier automotive specialty products trade event in the world. It draws the industry’s brightest minds and hottest products to one place, the Las Vegas Convention Center. In addition, the SEMA Show provides attendees with educational seminars, product demonstrations, special events, networking opportunities and more. Come on down to Capistrano Valley High School to support their boy and girl's wrestling team. The ghosts and goblins are alive when these cars come in stride. A wide array of years will be showcased, from pre-40's to post 1989. An event the whole family can enjoy with good food, vendor booths, and music provided by DJ Tony Suskie. Kids be sure to dress up! Cars and vendors will be handing out candy to all the spooky and cooky kids.